I think these are interesting photos because from the lateral view (at the top) there are some big changes but the solar and caudal views aren't so dramatic. There are some improvements from this angle but as you can see, he still has a long way to go before his digital cushion and frog are back to full health. It seems clear however that he is much happier to load his palmar hoof than he was when he arrived and that can only be good for the long term health of his feet. He has longer hoof wall than I would ideally like - and also did when he arrived - but as you can see, his breakover is clear and it is possible that he needs the extra medial wall as a supportive adaptation so while he is still improving there is, in my opinion, no justification for a trim. With apologies for the delay, here are Thomas's update photos now that he has been here 9 weeks. As up can see, his feet have improved a lot although there is still a fair way to go. He had already made some good changes - and had become significantly sounder - in the months after his shoes came off but before he arrived here so our job was to continue - and if possible speed up - his return to full work. Thomas has coped well with his increasing work levels, responding by growing a better foot, improving his soundness and putting on muscle so we are hoping for more of the same over the rest of his time here. Both front feet are more supportive and less under-run and he is landing confidently heel first now. He has some issues with stiffness in front and behind but regular work is helping. His feet are a good illustration of why taking shoes off - though an important element of growing a healthier hoof - is not enough on its own. However now he is back in work I hope he will carry on going from strength to strength. I'm interrupting the blog this week because recent events have overtaken us, as I am sure you are all only too aware. We have huge, important decisions to make on this Thursday and there are compassionate and principled people on both sides, although it is sometimes hard to believe that. It seems likely that the outcome will be very close and that whatever we wake up to on Friday, there will be a vast number of voters who are disappointed. We are being invited by pundits and politicians to pigeon-hole ourselves and polarise those around us, to see the decision in black and white. I'd prefer, in the words of Terry Pratchett, "to always see what is really there". One article today, which is urging readers to "Remain", is arguing that by staying in the EU Britain will help limit the EU from "lurching towards federalism" and that this will result in less regulation and "greater democratic accountability". An economist tells us we are better off in. Another article, urging readers to "Leave", states that it is only outside the EU that Britain can regain independence from EU bureaucracy and that Leave is the only option if we want democracy restored. A different economist tells us we are better off out. Both articles cite concerns over unrestricted immigration and both assert that it is possible to hold these concerns without being racist, bigoted or an extremist. I am sure there are bigots, racists and extremists on both sides as well but I am pretty sure that the vast majority of us - on both sides - are not. So it seems its possible to fear EU regulation and red tape even if you love the individual European countries who constitute our neighbours (and who will still be our neighbours on Friday morning). Its possible to fear the consequences of uncontrolled population growth and unchecked migration without wishing harm on those fleeing war and persecution. Its possible that our economy will be fine whatever happens and that economists find it as tricky as the rest of us to predict the future with certainty. Its possible to wish for democracy and accountability without being confident that either the Remain or Leave politicians are able to deliver them. I know how I am voting but I know friends and family who will vote the opposite way, even though our values and beliefs are similar. 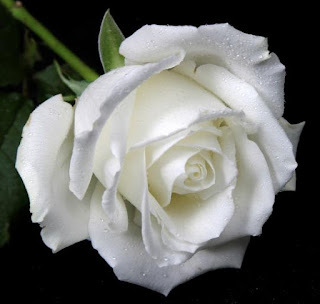 "We are far more united and have far more in common with each other than things that divide us". Holly's update is the next cab off the rank - her footage will follow later and I will post it here as soon as its available. Quite a change, I think you will agree, even though she had already been out of shoes a while before she arrived here. As you can see in the lower photo, she has some mild stretch in her white line where the old hoof capsule is now at ground level. 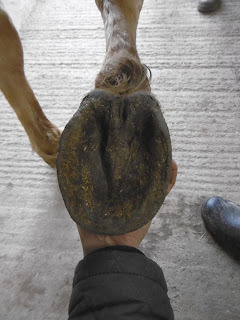 He new hoof capsule is much better connected and her toe will be shorter (and the stretch should disappear) as it grows down so its not a problem, simply a sign of a better foot to come. It never ceases to amaze me how fast feet can change - there is only 8 weeks between these photos after all. "You know, I've watched the video you posted last week of the horses coming in and this one several times because I was so struck by how dry and hard your ground is in the middle of Spring. My 8 year old mare has never worn shoes, is a on a strict and balanced diet and lives on a track system and yet we are still plagued with hoof troubles. These videos really explain everything though. The ONLY time my fields are ever this dry is maybe a 4-6 week period in July and August. The rest of the time, they either squelch or are covered in deep snow. Despite the hard ground around and in the barn, I cannot win against the constant waterlogged state of the hooves. I've already spent over $5000 providing that bit or dry, hard ground and it shrinks father back into the mud every year. I looked into trying to build a hard track, just 8 feet wide around my land, the cost was nearly $50,000. Watching those horses come tromping in off of dry pasture in the middle of May really brought home to me the impossibility of healthy bare feet on this property." I feel for DD because that particular video clip gave a totally uncharacteristic impression of the Exmoor climate, which is actually wet, wet, wet...and of course now, 3 weeks later, we are back to normal and are squelching around again. In a dry year we will also get a few weeks (rarely more than 3) of dry weather and thats exactly what we had in May. But before that we had (as I told her in my comment) an incredibly wet winter and we average between 75-90+ inches of rain a year. Wet weather really isn't a problem for bare hooves - in fact our own horses work hardest through the winter when the ground is truly sodden - and their feet still stand up to miles on roads and stony tracks. The secret is keeping the work consistent and feeding a very, very good diet. So here you go DD - and anyone else struggling with another "glorious" - or typically English summer - have a splash around with us :-) This is a video from a few years ago, in July, but you get the idea - and this June its back to normal here now, for sure! Wet morning from Nic Barker on Vimeo. The important thing for me - and for Caymen - was that in his "supportive" remedial shoes he was landing like this - toe first. So much for the "support". After 4 weeks out of shoes and in rehabilitation he is landing better - not as heel first as I would hope to see eventually but its a start and will allow his foot to strengthen further. Its a pattern I see consistently but I also still see owners, farriers and vets arguing that shoes provide support. It might be a more compelling argument if they could provide some evidence. Just as a reminder, here is Caymen's "supported" left foot - landing toe first in the still at the top. The same foot completely "unsupported" - and doing much better. The full footage is below for those interested. By the way, its not the floor sloping, just a poor camera angle, for which I apologise. Caymen landing from Nic Barker on Vimeo. Where did the last 8 weeks go? I'm going to spend this week concentrating on updates as several of the horses here right now are coming up to 8 weeks in their rehab, which is always a crucial time. By this stage I want horses to be working consistently on a variety of surfaces, including doing several hours of roadwork per week and, as you can see, I want to see not only feet getting stronger and more robust but solid heel first landings and improving media-lateral balance. These feet belong to Mrs Hoggett, whose landing has been good for several weeks now. Despite the fact that her feathers have grown back you can I hope see that the foot is more balanced and stronger now. She had good feet to begin with and her weak landing improved relatively quickly as a result. I'll be catching up on the rest of the horses over the next few days.